washed the red one and the weave is falling apart at the seams near the collar. I’m so disappointed in the quality on this one. This cable sweater is really pretty but the wool and mohair can make it slightly itchy for some with more sensitive skin. I found that my usual size XSP has a looser fit through the body. I would probably prefer my other size XXS regular for a slightly longer overall length. 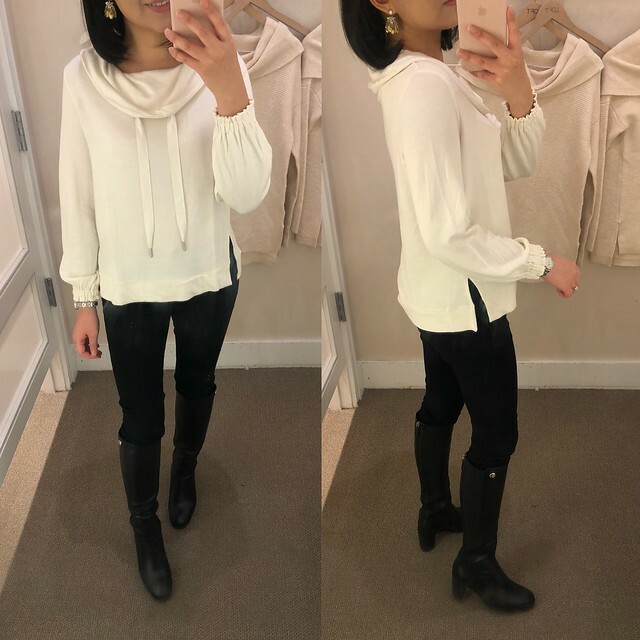 I love the cowl neck on this top and I had originally ordered size XXS regular which was a bit shorter so I ended up returning it after trying on size XS regular. The top has a shorter overall length hitting me a little past mid-hip but the side slits are not too high on me. When I raise my arms the slits tend to stay more closed so I don’t feel like I am exposing my stomach. If you are taller than me (I’m 5′ 2.5″) then you may be wary of this top unless you wear a base layer underneath. 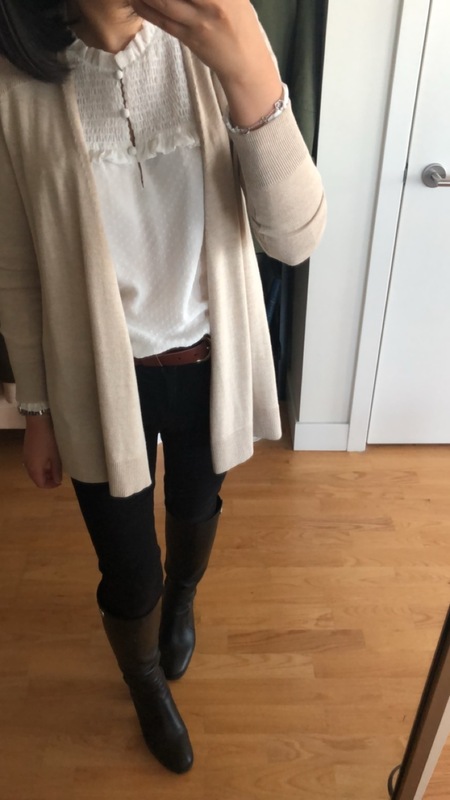 I had originally passed on this tunic sweater due to the longer length but I keep on seeing it on the bloggers I follow and it looks so cute. See size XXSP on Annie and size XSP on Su. I tried on size XSP here again and size XS regular for comparison (see above) and I accidentally put back the wrong size thereby purchasing and taking home the wrong size. Hopefully my store will have the size I meant to purchase when I go to exchange it. 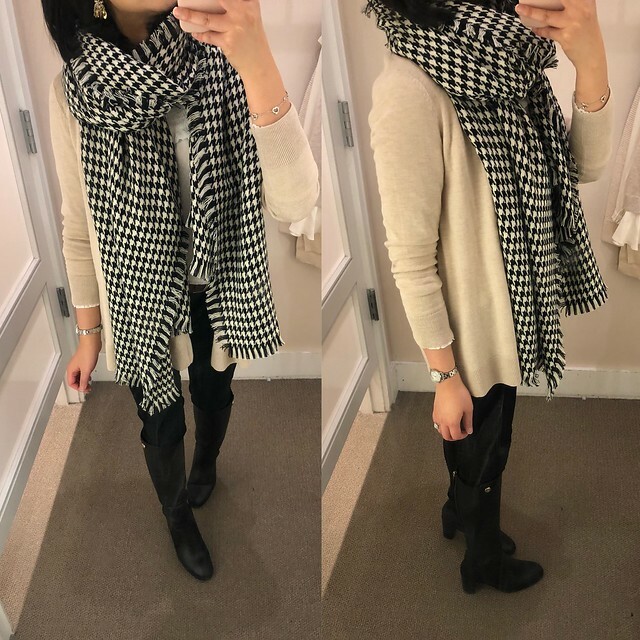 Ly recommended this cozy blanket scarf and I tried draping it for fun. 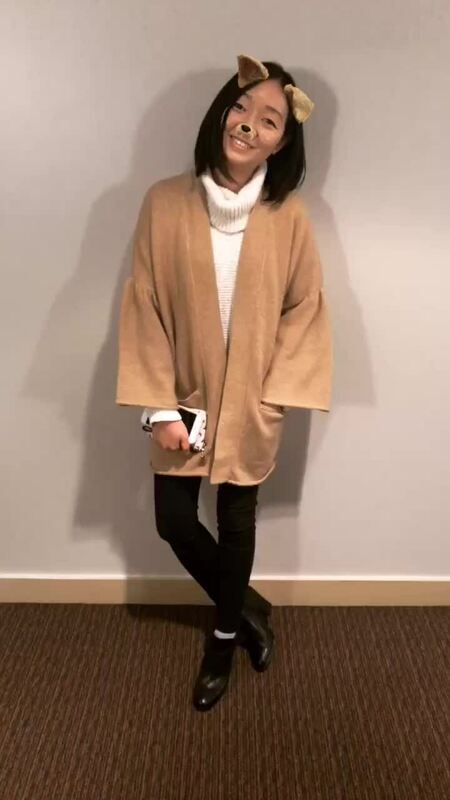 It’s very oversized and great for keeping your neck extra cozy especially if you live in a windy city or spend a lot of time outside in the cold during the winter. As a side note, my hair is currently an awkward shoulder length so I’m wary of my hair flipping out in various directions if I crush it by wearing a heavy scarf. 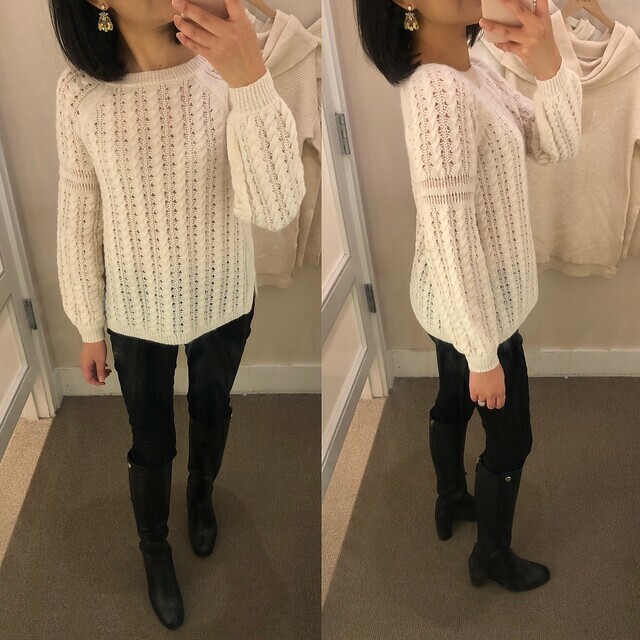 I found this blogger favorite sweater in the sales racks and decided to try it on out of curiosity. It looks really cute on but I was worried that the ruffle cuffs on the sleeves would get in the way of everything from eating to washing my hands easily. The bottom layer is not see through which is a nice touch. 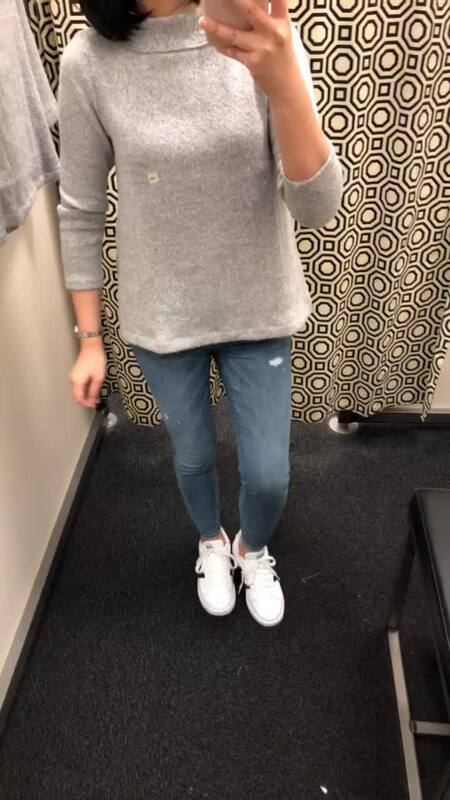 It is a really cute, thin sweater if you’re lucky enough to find it in the sales racks as it is currently sold out online. Size XS fit true to size and I liked the longer length of the shirttail hem which covered my front and backside. This mockneck swing sweater is one of my favorites from fall/winter 2016 (reviewed here). 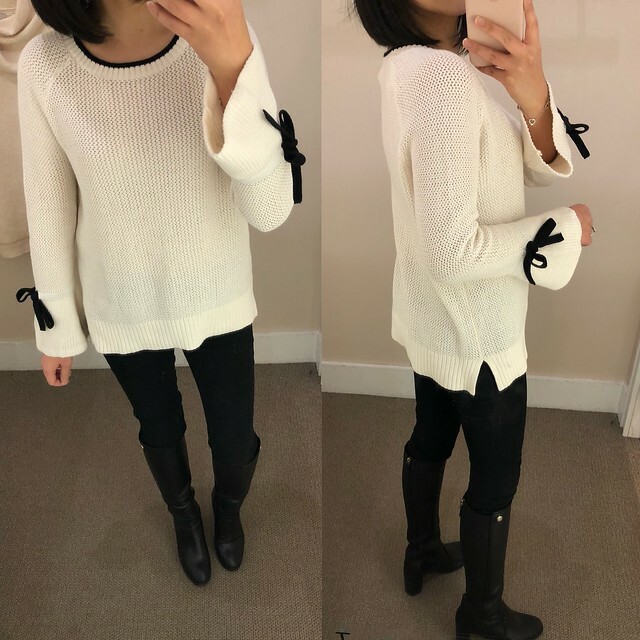 Erika kindly informed me that LOFT Outlet carries a similar sweater and it turns out they’re the same style! Size XSP fits similar to last year’s size XS regular. 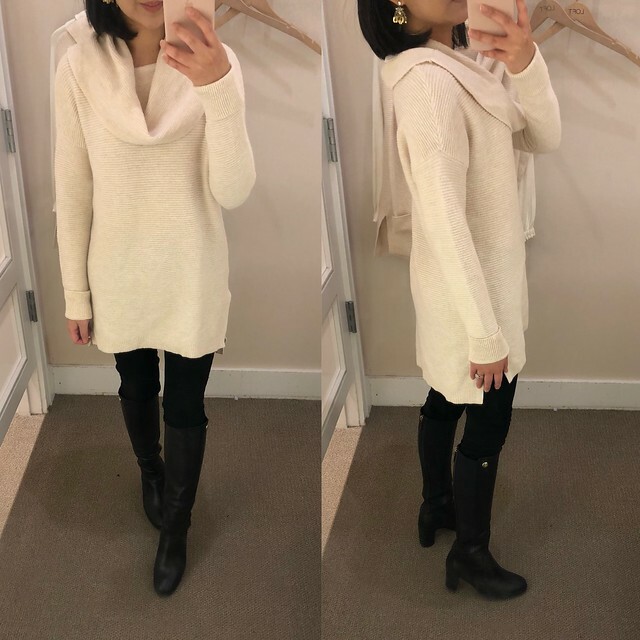 It has a swingy fit that I love and it’s really cozy. They also carry this past season favorite in a navy color. Regular LOFT carries this foldover pocket cardigan (review here) which is I noticed is made of exactly the same material (73% acrylic, 24% polyester, 3% spandex) and they’re both manufactured in Vietnam. 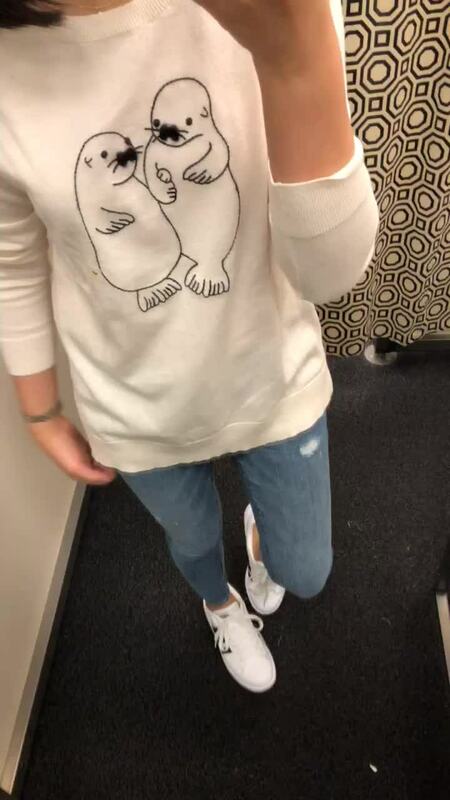 How adorable is this sweater? The details are just precious. I normally don’t wear animal print sweaters but I really wanted this due to the cute otters holding hands. Unfortunately the size I wanted was sold out but I tried on size MP which was too long and loose on me. 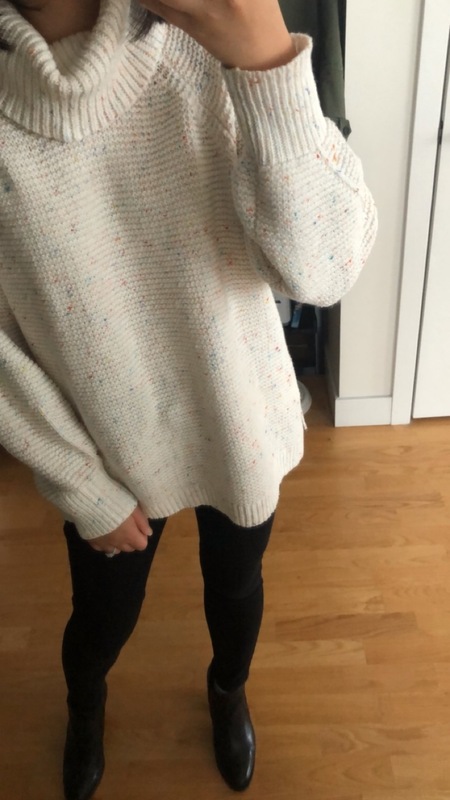 I’d say this sweater runs true to size but it looks cute worn oversized too. I forgot to note down the style number but it is a new arrival at LOFT Outlet. I wore these crystal floral leaf statement earrings for a full day and my ear lobes were sore. I had to take them off to give my ears a break. 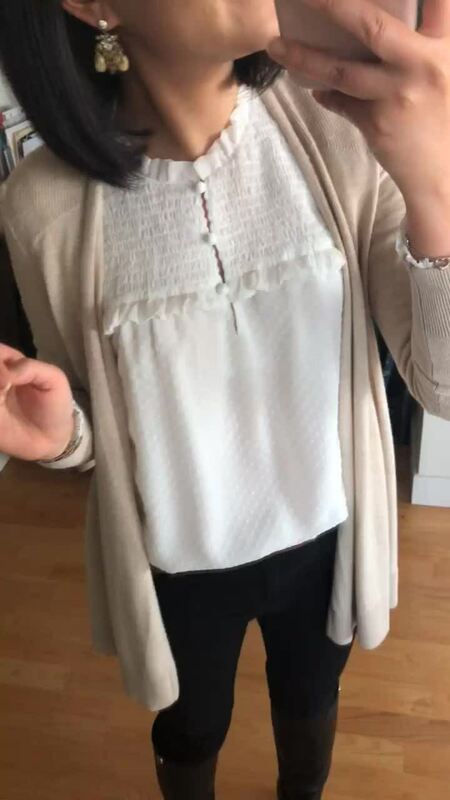 I also have the matching necklace (last seen here). 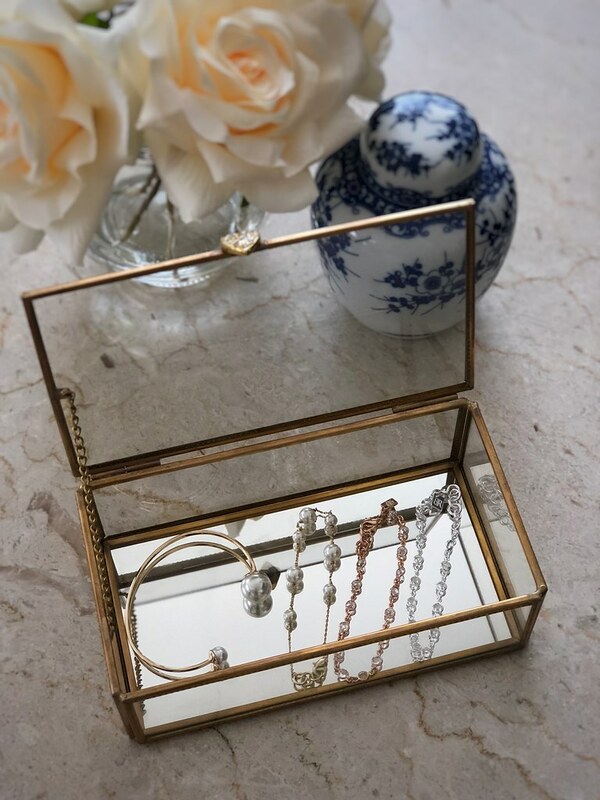 I ordered these pretty bracelets on Cyber Monday from Banana Republic and they arrived today! After seeing the delicate one in stores a few weeks ago I couldn’t get it off my mind. The pearl cuff fits me better than the similar one I have from Ann Taylor since the opening is smaller so it stays on better. For reference, I have a 6″ wrist. The two bracelets have a 1/2″ extender. The pearl cuff measures 2.75″ across and it has a 1″ opening. LOFT – Get 40% off sweaters and tops and save an extra 50% off sale styles. Valid in stores and online. Since the daily deal requires no code online you can use code LOFTCASH for an extra $25 off full-price promotional orders of $50+. Alternatively, cardmembers can save an extra 15% off your entire purchase in-stores or online with code GIFTING15. Excludes full-price Lou & Grey. Save this offer to your mobile wallet by texting GIFTING15 to 28162. Here is the mobile version of the coupon. Valid now through January 10, 2018. Read the fine print. Ann Taylor – Get 50% off sweaters and tops and save an extra 50% off sale styles. Use code SHOPNOW. Valid in stores and online. Alternatively, use code THANKS12 for an extra $50 off $100+ full-price promotional purchases. Some of you privately messaged me about missing LOFT cash cards from your recent online orders. I suggest calling customer service for assistance but I received mixed feedback from those of you that tried and it depended on which rep you spoke with. Customer service can mail your missing physical LOFT cash cards after checking your recent online orders. Alternatively, customer service can honor up to nine LOFT cash cards per phone order. LOFT cash only works on full-price merchandise (specifically items with prices that end with either .00 or .50). Special thanks to Jazmin‘s persistence for clarifying the above points with countless reps over chat and phone! Since you are limited to redeeming only one LOFT cash per online transaction I called customer service for assistance with redeeming multiple LOFT cash cards. The rep I spoke with last night explained that they cannot apply two promotion codes (yesterday’s cardmember sale on new arrivals required code VIP40). I called customer service again this morning when I noticed that it was 40% off tops and sweaters today and ‘no code needed’. First, I prepped my shopping cart before I called customer service to make sure I was getting the most out of the number of cash cards I wanted to redeem. $200+ (after 40% off) meant that I could redeem four LOFT cash cards since each cash card is $25 off $50+. 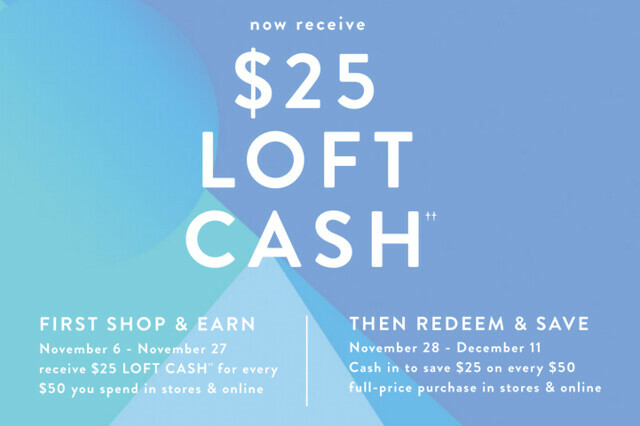 I also applied the LOFTCASH promo code in advance which is an online test that confirms that the LOFT cash code works on the full-price merchandise. The rep that helped me was able to see the items in my shopping cart when I provided my email address on file. 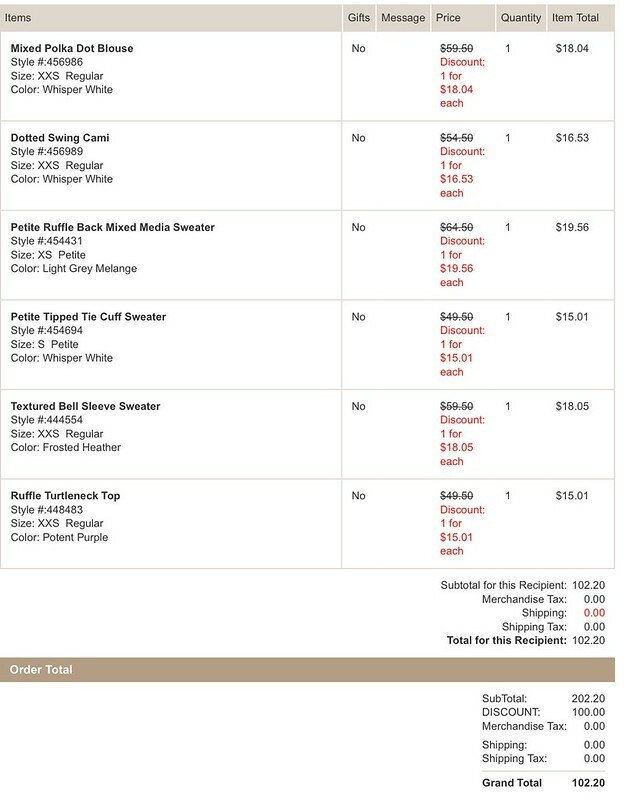 As seen in the order confirmation email below the rep applied four LOFT cash for an extra $100 off! 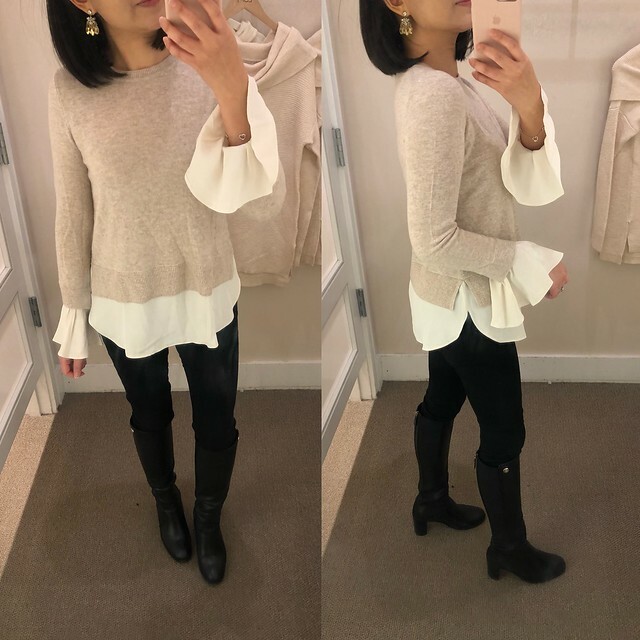 Again, this is on top of the tops and sweaters that are currently 40% off and ‘no code needed’ so I saved about 70% off retail! With regards to in store redemption, multiple LOFT cash cards can be applied towards the subtotal after the storewide discount (refer to this helpful Slickdeals.net article written by Lesley). Surprisingly, many of you shared (via an Instagram story poll) that your stores refused to honor LOFT cash on full-price promotional items. LOFT will explicitly state when an offer is ‘not combinable with other offers’ but this statement is not present in the fine print on the back of the LOFT cash cards. Apparently it is at the store’s discretion how they chose to honor the LOFT cash cards. After hearing this feedback I wanted to provide a way to share participating stores in the comments of this post on Instagram. My local LOFT store at the Prudential Center always honors multiple LOFT cash on top of the storewide discounts (e.g 40% off everything) and daily promotions (e.g. select full-price pants now $39.50). Refer to my recent in-store purchase receipt here. 1. FREE shipping on orders over $50+. Refer to this post to find out how to get lower minimum shipping. 2. Looking for extra savings? The LOFT insider code for November is INSIDER384. Use this code online during no code needed daily deals (e.g. 40% off select) for an extra $25 off full-price promotional purchases of $100+. Excludes Lou & Grey styles. Did you know that I always share the latest Insider code on the right side bar of my blog? 3. Cardmembers save an extra 15% off your entire purchase through January 10, 2018. 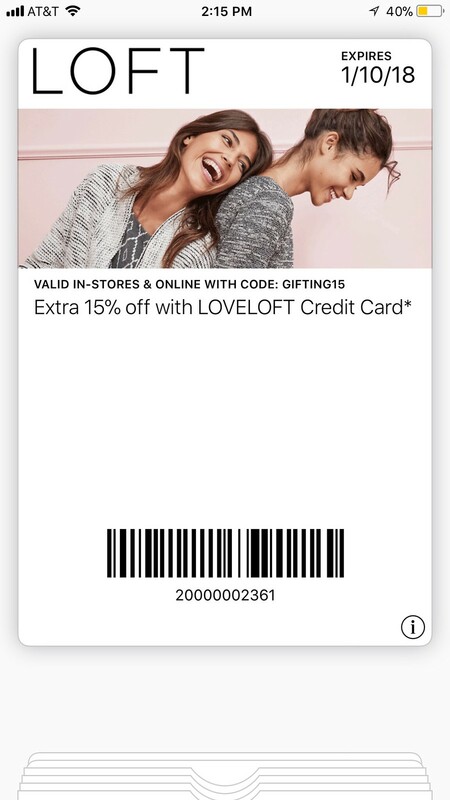 I received the latest LOVELOFT cardmember offer for an extra 15% off your purchase. Use code GIFTING15 online* during no code needed daily deals (e.g. 40% off select). Excludes full-price Lou & Grey styles. It also acts as an extra discount on top of sale merchandise! For example, it’s currently an extra 50% off sale styles but as a cardmember you can save an additional 15% off when you apply the code GIFTING15 at checkout. Save this offer to your mobile wallet by texting GIFTING15 to 28162. Below is the mobile version of the coupon. Read the fine print. *You may see the following error message: “Promo code has been applied to order but current items in bag are not eligible.” Do not abandon your shopping cart when you see this. Continue through the normal checkout process. You will see the extra 15% off discount reflected after you enter your credit card’s security code when reviewing the order and right before clicking on the ‘place order’ button. Note: The online shopping cart on accepts one promo code at checkout so use this offer during no code needed daily deals. 4. 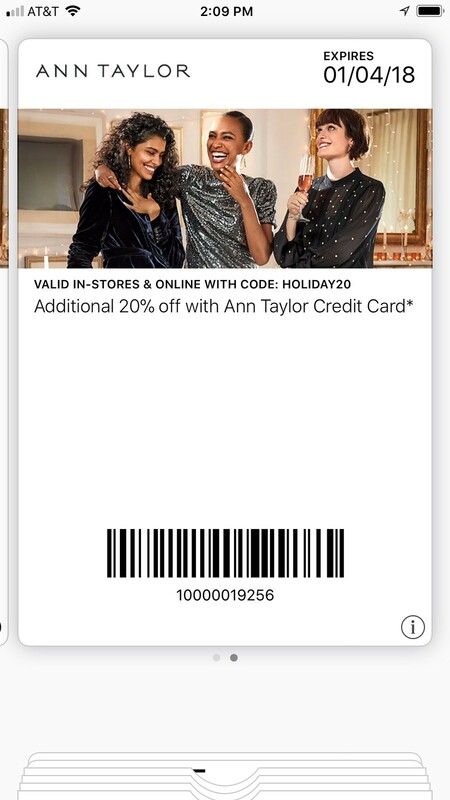 Cardmembers enjoy an extra 20% off your entire purchase at Ann Taylor with code HOLIDAY20. Text HOLIDAY20 to 75013 to add this offer to your mobile wallet. 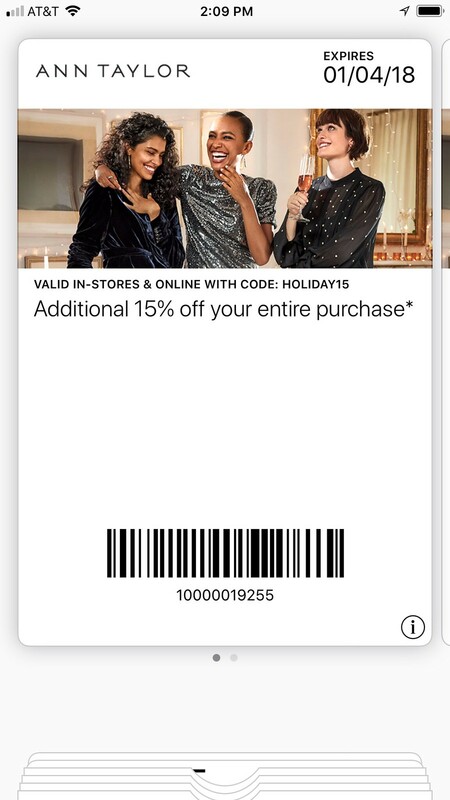 Non-cardmembers enjoy an extra 15% off your entire purchase at Ann Taylor with code HOLIDAY15. Text HOLIDAY15 to 75013 to add this offer to your mobile wallet. Valid November 14-January 4, 2018. Certain product exclusions apply. Refer to the physical mailer here. 5. Receive $25 off your full-price purchase of $75+ at Ann Taylor. Valid in stores and online. To redeem online use code THANKYOU25. In stores use code 10000019236. Offer may only be used once. Exclusions apply. 6. 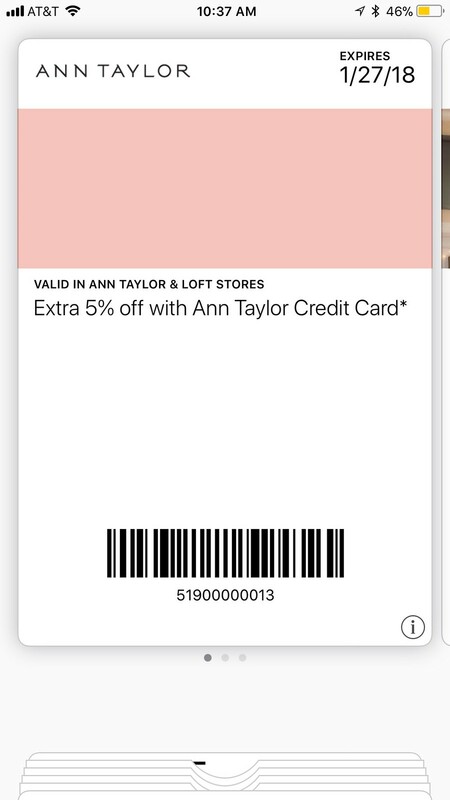 Take an additional 5% off your entire purchase at Ann Taylor and LOFT stores with your LOVELOFT or Ann Taylor Credit card. Special thanks to @adorableloan for sharing this offer! Here is the physical mailer and here is the mobile version of the coupon. Text EXTRA5 to 75013 to save the offer to your mobile wallet. This code is valid in stores only and for multiple use at both LOFT and Ann Taylor now through January 27, 2018. Read the fine print here. 7. I also received the latest LOFT Outlet coupon. 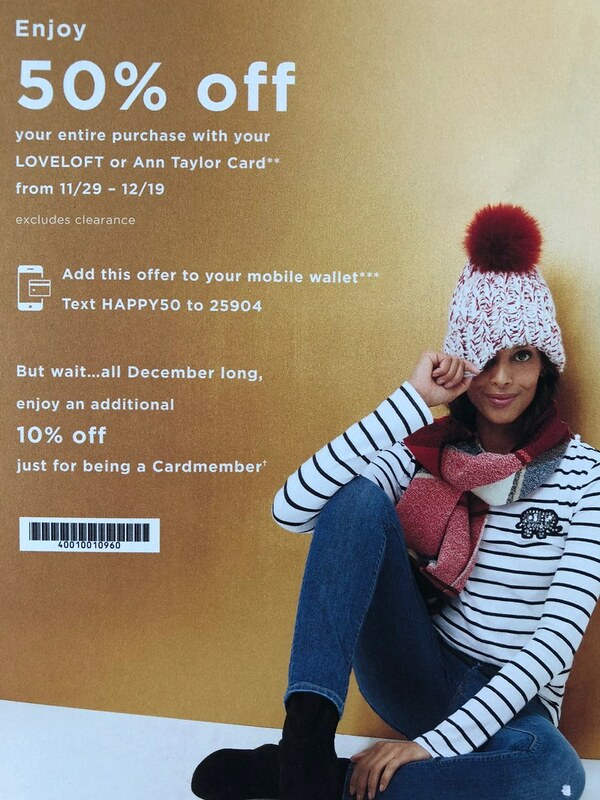 Enjoy 50% off your entire purchase at LOFT Outlet with your LOVELOFT or Ann Taylor Credit card. Text HAPPY50 to 25904 to add this offer to your mobile wallet. Excludes clearance. Offer valid at LOFT Outlet stores 11/29/17-12/19/17. But wait… all December long, enjoy additional 10% off just for being a cardmember using code 40010010960. If you like these shopping tips please refer to this page for the latest offers (updated daily).